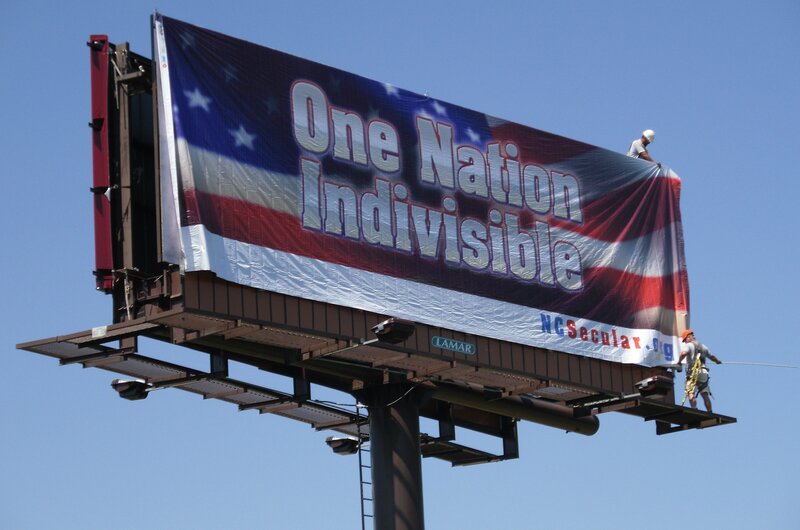 On June 21st the artwork above started appearing on billboards across North Carolina, from the mountains to the sea. These billboards are appearing in the following areas: Asheville, Winston-Salem, Greensboro, Charlotte, Raleigh, and Wilmington. This campaign is intended as a consciousness-raising effort to point out how every U.S. citizen who doesn't believe in a monotheistic god is being "officially" marginalized, disrespected, and discriminated against by the insertion of "under God" in the Pledge, by the supplanting of our former de facto national motto--E Pluribus Unum (Out of Many, One)--with "In God We Trust," by language in certain state constitutions (like the one in NC) which restricts anyone that doesn't believe in a monotheistic god from holding public office, and in many other ways. We believe the evidence clearly demonstrates that our Founders intended to establish a secular government, one that separated church from state. We believe the kinds of officially sanctioned marginalization and discrimination covered above is unconstitutional, that it violates the intentions of the Founders, and that it is fundamentally unfair. All we are asking is that every citizen give every other citizen the same kind of consideration they expect for themselves, and that we all try to live up to the spirit of the ideals our Founders gave us of liberty and justice for all. The cost of this campaign is over $15,000.00. 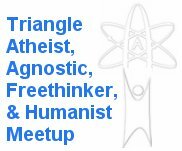 The campaign is being funded through donations from the individual groups involved and FreeThoughtAction, a national freethought marketing organization. "...the Government of the United States of America is not, in any sense, founded on the Christian religion..."
"I pledge allegiance to the flag of the United States of America, and to the Republic for which it stands; one nation, indivisible, with liberty and justice for all." "I pledge allegiance to the flag of the United States of America, and to the Republic for which it stands; one nation, under God, indivisible, with liberty and justice for all." 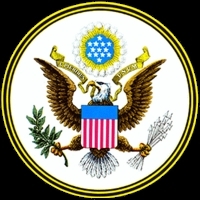 "E Pluribus Unum (Out of Many, One)"